Food shopping should not be a chore! Hopefully, as you age, you will begin to make the necessary changes to your diet that will fuel you, so that your food shopping experience will be a rewarding one. 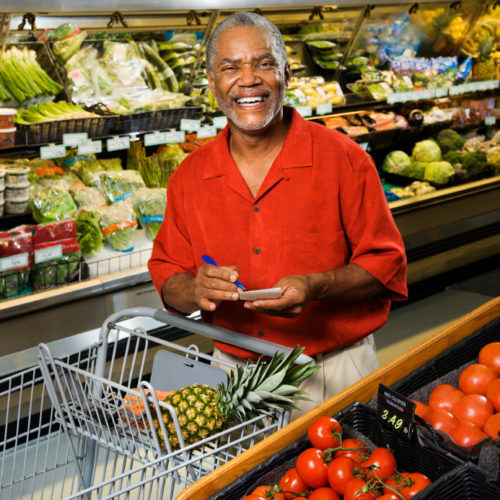 Nutritionists agree that making a plan before hitting your fave market is your best bet. Planning your grocery shopping helps you save money particularly if you’re on a fixed income and can even result in a smarter list of food items. Food shopping should not be a chore, but if it is and you find yourself coming up with excuses for not venturing out, you might want to change things up a little to make it more bearable. Most major supermarket chains have motorized carts if mobility is an issue for you. Don’t hesitate to ask a store employee for help in reaching items on higher shelves, pushing your shopping cart or carrying heavy bags to your vehicle. If you’re feeling pooped while shopping and there is a pharmacy within the store with seating, sit a spell to take a breather. Shop on a day when you feel the most rested. Pick a time to shop when a store is less crowded to avoid long check-out lines. Check with the National Association of Area Agencies on Aging or Eldercare Locator to see if there are volunteers who can help with your grocery shopping. For older adults, consuming a variety of nutrient-packed foods has been linked to reduced risks for developing chronic health conditions, such as osteoporosis, arthritis, obesity, high blood pressure, diabetes, heart disease, and certain types of cancer. Fueling your body with the right foodstuff can also help you stay independent and active. Don’t overlook foods that are high in fiber, potassium, calcium, iron, Vitamins A and C and especially D, a crucial mineral that is needed as we age. Stay away from foods ladened with cholesterol, saturated or trans fats, loads of sugar and tons of sodium. Practically every food item comes packaged with a nutritional label that tells you what you are consuming. The labels provide you with information about calories, serving size, and nutrient content of a food item so that you can make healthy selections when you shop. Percent Daily Value (DV) on the Nutrition Facts label is a guide to the nutrients in one serving of food. For example, if the label lists 15 percent for calcium, it means that one serving provides 15 percent of the calcium you need each day. Use the Percent Daily Value (% DV) column when possible; 5% DV or less is low, 20% DV or more is high. The Supplemental Nutrition Assistance Program (SNAP) can help you get the healthy food you need. Over 4 million older adults use SNAP to buy food, and the average senior receives $113 each month. Check out BenefitsCheckUp.org/getSNAP for more information about a program that can help put healthy food offerings on your table. Kym Whitley has got “comedic goods” and it’s contagious! Second act career: Pamela M. Thomas is dancing for the NBA Cleveland Cavaliers! Martha Wash “The Queen of Clubland” still reigns supreme! Twice a month, 50BOLD will inform, inspire and empower you! We want to showcase all of the immeasurable contributions of Black people age 50-plus. 50BOLDers are viable, strong, we're able to take stock of our lives with a clear eye and appreciate where we came from, how we got here, and what we've achieved along the way. We are also looking to move forward armed with newfound knowledge so that we can continue to fight the good fight because age ain't nothing but a number!